Numerous tools are available for the modelling of building stocks. However, the challenge remains to define the resolution levels that allow a better understanding of the linkages between the different scales, from issues within buildings’ boundaries to the interactions between markets and policy. The building-stock modelling approach that has been developed within the Pathways research programme represents a framework that allows a combination (or choice) of different assessments at the reference-building level to be extrapolated to the building-stock level for a different combination (or choice) of outputs. Important is to assess the effects of various types of Energy Conservation Measures (ECM) to the building stocks of the different EU Member States. In the assessment of energy use at the building level, the modelling considers e.g. technical building systems, indoor air environment, and on-site generation based on renewable electricity supply. The variety of outputs is tailored for investigations of energy system issues, climate change mitigation, and policy targets. A building stock of a country can be described in terms of sample buildings or archetypes. Sample buildings represent actual buildings for which data regarding thermal characteristics are obtained through measurements. As the building stock of a country consists of buildings with different characteristics, an extensive sample of the buildings is required for derivation of the thermal characteristics of the building stock. Thus, establishment of the sample requires significant efforts for measuring and quantifying the parameters of the building sample. Archetype buildings are instead statistical composites that provide an approximate description of the building stock, based on knowledge of the overall building characteristics within the region (e.g., age, size, construction materials, and house type), in combination with national statistics that relate to the building sector (e.g., energy use and climate). Thus, a methodology has been developed to describe building stocks through archetype buildings. This methodology consists of (see Figure IX): (1) segmentation, in which the number of archetype buildings required to represent the entire stock is decided based on criteria that include building type, construction year, heating system, and climate zone; (2) characterisation, in which each archetype is described by its physical and technical characteristics; (3) quantification, in which the number of buildings in the stock represented by each archetype building is determined. 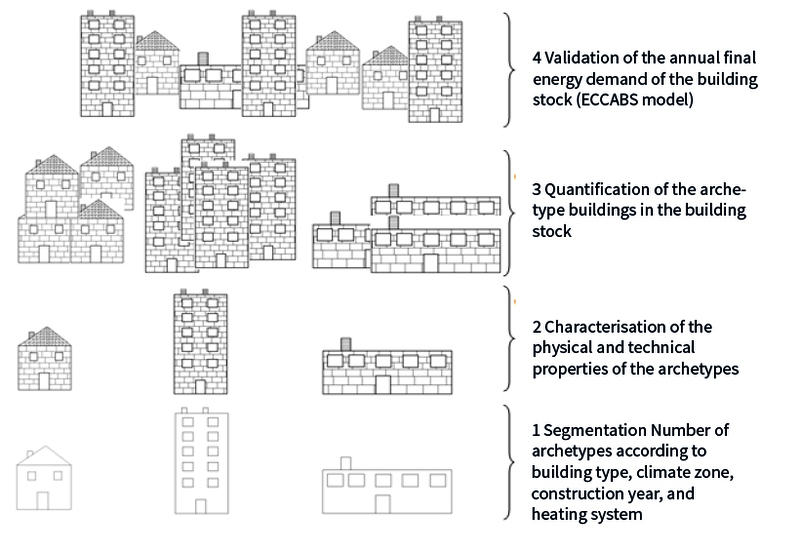 Once the aggregation of the building stock based on archetype buildings is completed, it is used as an input to the Energy, Carbon and Cost Assessment for Building Stocks (ECCABS) model, in which the net and final energy demands for the entire building stock under investigation are simulated. Thus, in the fourth step, the validation (4), the building stock description is validated in which the final energy demand and associated CO2 emissions for the building stock, as derived from the model, are compared with the corresponding values obtained from national and international statistical databases. The ECCABS model is a bottom-up engineering model that has been developed to assess energy conservation measures (ECMs) and CO2 mitigation strategies in building stocks, with the aim of making it applicable to any EU Member State. A major challenge associated with bottom-up engineering models is to find a level of detail with a reasonable input data requirement, while retaining sufficient spatial and temporal resolutions to allow investigations of changes in demand and the indoor climate environment. To meet this challenge, the ECCABS model combines a one-zone approach and hourly calculations. The one-zone spatial resolution of the heat-balance implies that the representative building is modelled as a single thermal zone by means of an equivalent volumetric heat capacity. The hourly temporal resolution of the heat-balance allows considerations of the temporal changes in demand that result from occupancy, the use of different appliances, and the effect of solar radiation gains. This level of resolution reflects the complexity of implementing measures that involve management of the building technical systems or user behaviours, and allows analyses of the effects on indoor temperature of applying ECMs. The hourly calculations of the net and final energy demands are thereafter aggregated to annual values. The model is used both to calculate the energy demand for the different end-uses and to estimate the effects of ECMs, for a set of individual representative buildings (either sample buildings or archetypes buildings may be used). The results are then extrapolated to represent an entire building stock of a region or country. For the validation of final energy demand, the aggregated model results have been compared to the corresponding data for the building stocks of France, Germany, Sweden, Spain, and the UK, which are found in the national statistics and international databases. The resulting final energy demand for all countries is in general agreement (within the range of +2% to -7%) with the international statistics. Figure IX: Illustration of the bottom-up methodology used to describe a building stock through archetype buildings. Adapted from a figure created by Ribas Portella (2012).